The cheetah is an amazing African animal. It is a popular and well known animal by many, due to its characteristics. They are found mostly in Saharan Africa, south of the Sahara desert. They hunt in pairs, and usually dominate a territory of about 35 square kilometres as well as being amazingly fast animals they are also very family orientated. 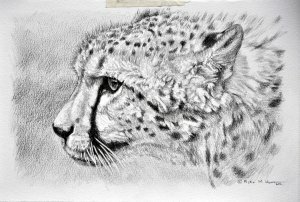 In my opinion cheetahs are one of the most difficult of the big cats to portray and paint as their features, fur and anatomy makes them look somewhat unnatural especially in the limbs which are freakishly long but obviously built for speed. It gets its name from a Hindi word meaning "spotted animal". This amazing animal/cat is covered in spots (apart from the throat and abdomen area). They have a small head, almost disproportionate to the size of their body and limbs. They weigh about 50 kilograms on average, with males weighing more and being slightly larger than females. They stand at about 80 centimetres tall, and about 1.3 metres long. Their tail measures in at about 75 centimetres. 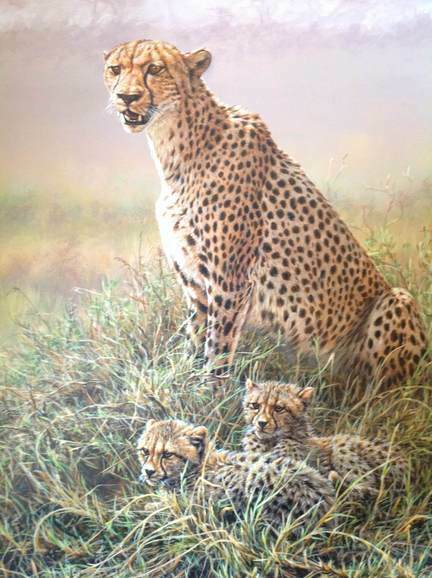 The cheetah is a carnivore, and therefore eats small animals. They have keen eyesight, and use this primarily when hunting. 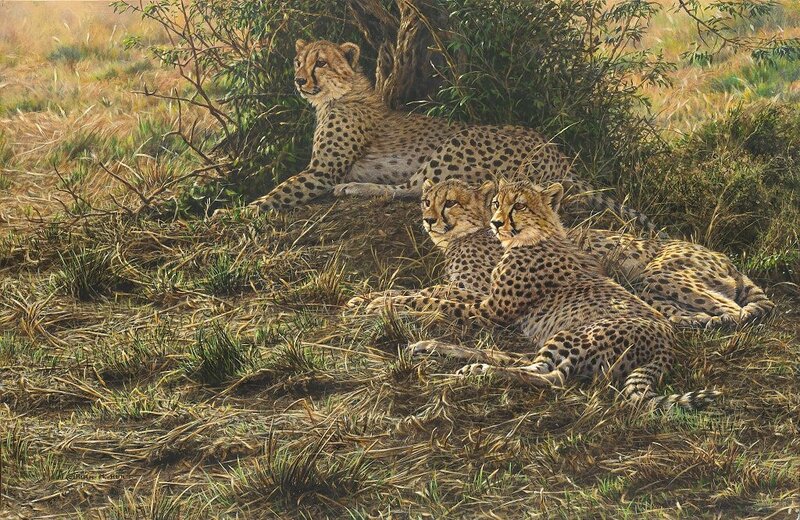 They stay almost camouflaged in grass, or climb a tree and scan for their prey. They then chase their prey at speeds of up to 80 km/h. 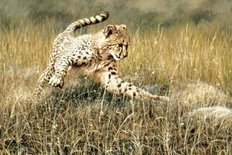 If the animal is small, such as a hare, the cheetah will simply maul the hare to death, but if it is larger, the cheetah will go for the throat, and block the windpipe until the animal stops breathing. Cheetah's have a gestation period of between 90 to 95 days with 2 to 4 cubs born. After 6 weeks, the cub leaves their den, and is strong enough to join hunts with the pack. When they are 6 months old, the mother is known to capture live prey and for the cub to practice its kill technique. The cub continues to live with mother for a further year learning hunting skills and survival techniques. 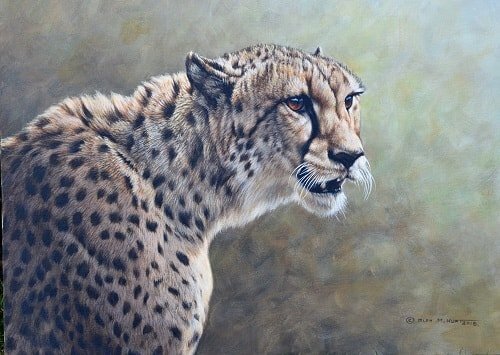 Cheetah paintings are popular subjects amongst collectors of wildlife and Alan is open to completing privately commissioned paintings of this beautiful cat. Please contact Alan if you wish to know more or would like to have a commissioned painting. The cheetah is the fastest land animal, they can bound at speeds of up to 113 km/h ! Cheetah's accelerate from 0-70 km/h in under 2 seconds. Being cats, cheetahs can purr and growl. They can also bark and hiss, but they do not roar like a lion or other big cats.